Facebook for Every Phone was released today which is a Facebook application for mobile phones that can be used in all types of mobile phones. This Facebook application can be used by all types of mobile phones and even the most ancient ones, It's true! Facebook for Every Phone can be used in over 2500 types of mobile phones. In short conclusion, every cell phone that can run Java applications will be able to install and run "Facebook for Every Phone". 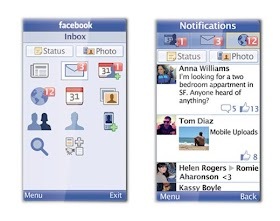 'Facebook for Every Phone' features are not inferior to similar Facebook application made ​​specifically for the Blackberry or Android. This application can easily monitor the News Feed, Inbox, Photos, Wall, Uploading photos to Facebook and find friends from your phone contacts. What makes it more interesting Facebook has even worked with mobile operators in different parts of the country to provide free access to Facebook for 90 days. Facebook for Every Phone can be download at m.facebook.com or you can install it directly at d.facebook.com/install from your mobile browser.